M.P's Rozgar Dhaba is a unique rural initiative that deserves all the attention! Read everything inside. A tea stall based in M.P in Sehore’s Nashrullaganj is serving as a centre of exchange of info on livelihood and probable employment. What an excellent initiative to act as a mid-point for those who cannot access internet for employment opportunities considering everyday rural jobs don’t mention on a platform. Vinod Pandey, a thirty-five-year-old development professional who is originally from Bihar has taken up this unique task of connecting daily wage workers to probable employers. While majoring in developmental research studies, Vinod dealt with numerous projects related to unemployment in India, particularly Delhi. This is where the idea of Rozgar Dhaba emerged. However, it took Vinod nearly a year to bring his concept to action. Remarkably, he expanded his idea when he travelled to Bengaluru. Eventually, with his three friends, Vinod set up the Dhaba in Shehore. Vinod has held over 20 job fairs featuring the initiative, and these hubs have catered to over 1,000 people a month! What’s note-worthy is, the revenue earnt from tea sales are reinvested in the same village to re-enrol girls who have dropped out of school through another initiative with the name girls2schools. Always a keen observer of how people leave towns in search for jobs and often go through hardships and several events that are uncalled for. In one of his interviews to the local media, he expresses how one of his older cousins migrated to Punjab in search of jobs and never came back. How he lived in slums without any proper work or access to healthcare and died there. Pandey says that was his moment of realization, he was just 12 at the time but was determined enough to do something about it. 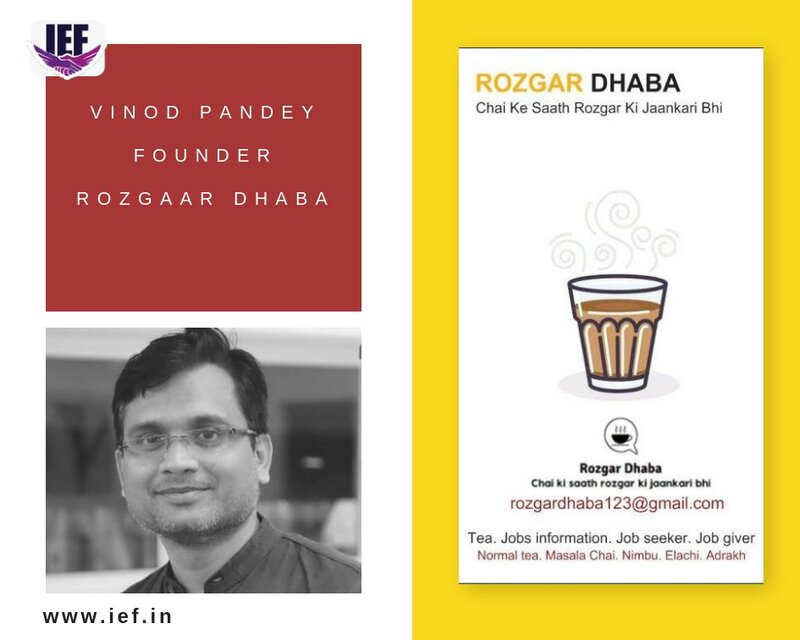 His vision eventually took form when he decided to help rural jobseekers to find work and avoid unsafe migration to cities, hence the Rozgar Dhaba came in existence. The idea emerged during his higher education in 2007, when he worked on a project on the employment and unemployment situation in Delhi. Ten years later and a few experiments after, it officially began in May 2018. Vinod highlights how migration from rural areas to cities isn’t based on a lack of employment but the lack of information about locally-available jobs. When Vinod started community meetings, he realized that with cities having several employment portals like LinkedIN Naukri, Monster.com, which help people connect to the right employers and they can easily choose. However, the rural India has a dividing gap which makes it worse for an average rural Indian to find employment. And hence the idea of bringing both employers and employees together in an informal setting, in a dhaba that sells tea, came into being. The simple model which collects job information from local vendors and employers along with details about jobseekers, and brings them together. And that’s not it, beside everyday job queries, the dhaba also connects farmers who want to sell their produce and lists buyers looking to buy it. It also posts information on villagers who rent farm equipment, school and college admission notices and government schemes. Just like an online portal would do, Employers here are given access to a list of prospective candidates with their required details and qualifications. While the dhaba charges for tea and snacks, the information is dispensed completely free of cost. It also uses WhatsApp to give out information. Apart from the sale of tea, the dhaba earns revenue from advertisements and farm produce stalls. At present, the dhaba has five employees directly involved in the daily business. Their salaries are paid using the revenue the tea stall makes and tips and donations by people who resonate with the idea. In the initial years, Vinod ran the initiative with his own money. Quoting a source, “The success of one dhaba will help set up another and upscale the initiative. It’s a revenue-based development model and we look forward to it being a policy solution for unsafe migration and unemployment in countries like India,” says Vinod. Rozgar Dhaba is part/an initiative of Development Innovation Foundation (DIF). You, get in touch with Vinod on vinodnmtt@gmail.com or rozgardhaba123@gmail.com. IndoreHD salutes this excellent initiative and urges you to participate or help in whichever way possible. Cheers!